* They always look after each other, it is nice to see them growing up not only as sisters but friends too. * They have the ability to always put a smile on my face. * They aren't afraid to be unique. Unfortunately though, there are a lot of young girls out there who don't know just how great they really are. 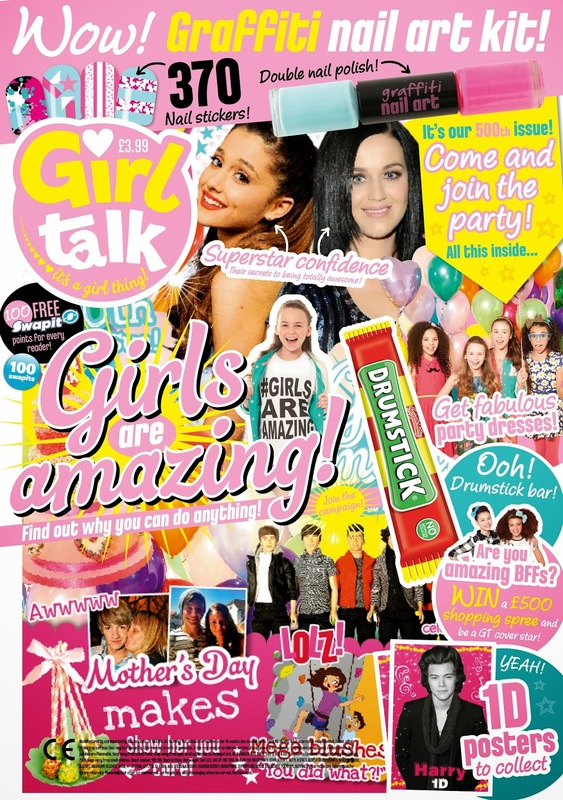 This week saw Girl Talk release their landmark 500th issue and with it they also launched their #GIRLSAREAMAZING campaign. I was asked, along with a few other bloggers if I would like to be involved with the campaign. I honestly felt honoured to be able to help promote such a great project, I for one think it is important that girls realise just how special and important they all are. A special anniversary poll in Girl Talk found that Katy Perry was voted most admired celebrity quickly followed by Taylor Swift and Jessie J, unfortunately not many sportswomen, politicians or businesswomen made the list. Scarily the survey also revealed that a huge 80% of young girls wanted to be referred to as pretty, kind and funny with a small 20% choosing words like clever, strong or brave. With a third of girls surveyed aspiring to have jobs in "showbiz". The idea behind the #GIRLSAREAMAZING campaign is to promote positive female role models, broaden young girls ambitions and help boost their self esteem, give them a new found confidence. I asked some fellow bloggers who they felt would be ideal role models for not only their daughter's but all young girls. Fiona from mamaslittlebabyloves said : "mummy is the best and most important role model". Carly from mummyandthechunks said : "people like Katie Piper would be a good role model for older girls, especially when it comes to confidence and showing them what they can achieve". Karen from adventuresofamonkeyfootedmum said : "Loads of women in business I really admire, the lady who started Tots Bots really inspires me and all of the olympic GB team". I agree with all of their choices. I think there is far too much media focus on the "prettiness" of celebrities rather than on what talents they actually have and what they can teach us. I wrote a post before worrying how me wearing make up will affect how my daughter's will think of themselves. I myself had self esteem issues when I was younger and I am keen to help all girls know that they are all beautiful regardless and that being different and being individual is a good thing. My eldest daughter, Elise, is now 8 years old and I also put the question to her, who would make a good role model for girls? She said Jacqueline Wilson, her reason, because she not only loves reading her books but she also aspires to be an author like Jacqueline when she grows and she feels that her stories are very inspiring. So come on lets work together to remind everyone just why GIRLS ARE AMAZING!!!! True, girls are really amazing. As you said, some fail to discover how special they are. I love them for their care, love, emotions... I love them for their gentleness, watchfulness and for their smiles in pains. I wish all girls discover how special they are. Girls really are amzing, it's great that we are celebrating that.